North Dakota is presently the Nation's fourth largest oil-producing State, trailing only Texas, Alaska, and California. 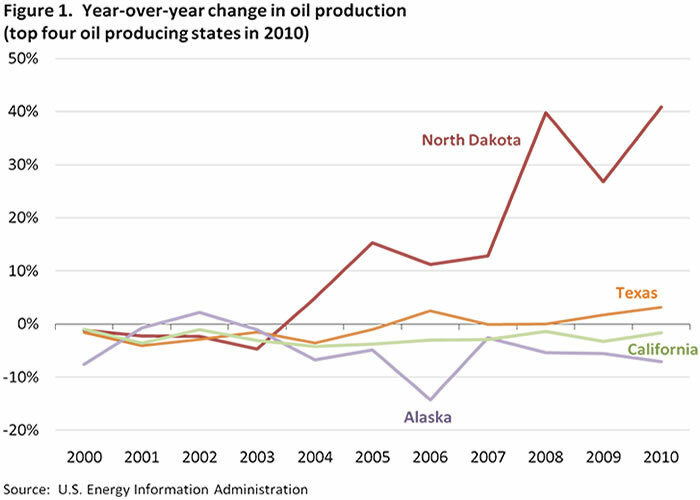 North Dakota's oil production averaged 307 thousand barrels per day (bbl/d) in 2010, more than triple its 2005 level. The State's oil production has continued to rise in 2011, averaging 341 thousand bbl/d in January and 360 thousand bbl/d in February. North Dakota's production growth rate is especially impressive when compared with that in other leading States over the past decade (Figure 1). As discussed in the April 27 edition of This Week In Petroleum, much of North Dakota's production increases are associated with accelerating horizontal drilling programs in the Bakken shale formation situated in the northwest portion of the State (and extending into Montana and portions of Canada). 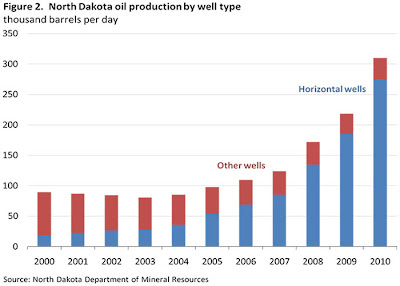 By combining horizontal wells and hydraulic fracturing (the same technologies used to significantly boost the Nation's shale gas production), operators increased North Dakota's Bakken oil production from less than three thousand bbl/d in 2005 to over 230 thousand bbl/d in 2010. According to data provided by North Dakota's Department of Mineral Resources (Oil and Gas Division), almost 90 percent of the State's total oil production in 2010 was from horizontal wells, which accounted for only about 55 percent of oil production in 2005 and just 20 percent in 2000 (Figure 2). 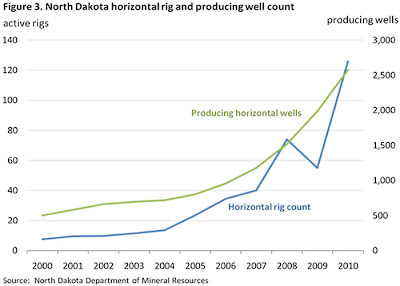 The number of active horizontal rigs and producing horizontal wells has both increased considerably in recent years (Figure 3). Sustained high crude oil prices have supported the increased drilling activity, as have technological advances that have significantly reduced the time required to drill and complete a horizontal well (25 days in 2010 compared to 65 days in 2008, according to the State's Department of Mineral Resources). North Dakota's oil production is expected to continue to increase as operators intensify development activity at the Bakken and underlying Sanish/Three Forks formation. 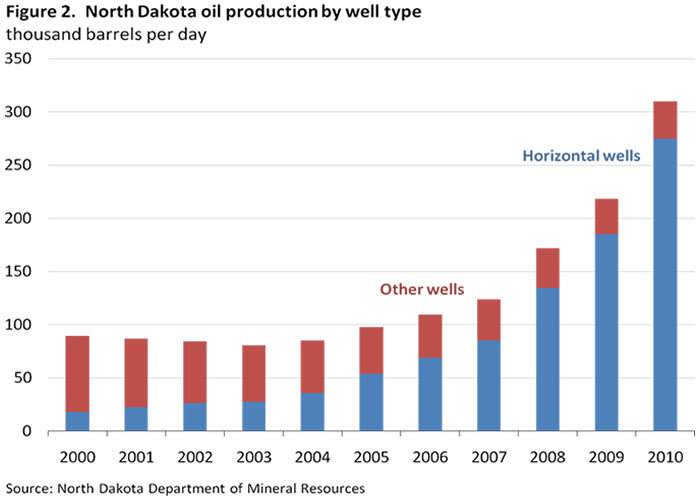 The State's Department of Mineral Resources recently projected that production from the Bakken and Sanish/Three Forks could possibly double, increasing to as much as 700 thousand bbl/d within the next four to seven years.1 Such an increase could make North Dakota second only to Texas in the ranking of oil-producing States, although each would likely continue to trail the Gulf of Mexico Federal Offshore, the Nation's leading producing region since 1999. While existing crude oil take-away capacity would be unable to accommodate a doubling of North Dakota's production volumes, the State claims that additional pipeline and rail projects currently in the planning stage should provide adequate capacity until 2015. In addition to expanded infrastructure within North Dakota, long distance transportation of increased oil volumes could occur via an interconnection with TransCanada's planned Keystone XL pipeline. While the State points to a 2013 start-up for Keystone XL, the project has not yet received final approval from the U.S. government. Due in part to capacity restraints and distance from the Nation's refineries, North Dakota sweet crude oil sells at a discount to West Texas Intermediate (WTI). According to North Dakota's Department of Commerce, North Dakota crude typically sells for $10 less per barrel than crude at Cushing, Oklahoma, where benchmark prices are set for WTI on the New York Mercantile Exchange. North Dakota's natural gas production, which has increased considerably as a result of expanding drilling programs at the Bakken, also faces transportation and processing constraints. As of May 2011, flared gas had risen to a record 29 percent of total North Dakota natural gas production, an increase of 1200 percent since 2004, when Bakken production began showing rapid growth. The State has announced significant new gas processing plant and gathering pipeline expansions to accommodate increased natural gas production. An April 2008 U.S. Geological Survey (USGS) assessment estimated that the Bakken formation held undiscovered, technically recoverable oil resources of between 3.0 and 4.3 billion barrels (technically recoverable oil resources are those producible using currently available technology and industry practices). The 2008 Bakken estimate reflected a 25-fold increase in the volume of technically recoverable oil compared to the prior USGS estimate made in 1995. The USGS plans to conduct a new resource assessment of the Bakken starting in October 2011.